Free shipping within US on orders over $75. Wellness in your back pocket. A must-have natural farmacy for every day, including five of our most loved roll-ons to ease your head, pain, cough, stomach and stress. Feel the relief and the release with blends designed to support your overall wellness. Includes Peppermint Halo® Oil Blend, Fortify® Oil Blend, Gutzy® Oil Blend, Stress Release Oil Blend and Pain Release Oil Blend. Rub on the throat and chest in a thick layer. Cover with a warm, dry cloth if desired. Clothing should be loose about throat and chest to help vapors reach the nose and mouth. Use up to three times daily or as directed by a health care practitioner. Children under 12 years of age: Ask a health care practitioner. Directions adults and children 12 years & older: Apply to affected area not more than 3 to 4 times daily. Children under 12 years: Consult a health care practitioner. Apply as desired to entire hairline, creating a halo effect. Apply to neck and shoulders for extra cooling and relaxation, avoiding eyes. Apply directly onto stomach, as desired, and massage in gently. Apply to forehead, neck and shoulders. Put several drops on a tissue and inhale deeply or insert into pillowcase before bed. Add 10-25 drops to a bowl of steaming water; inhale deeply for 5-10 minutes. Add 7-12 drops to a full bath and swish to disperse well. Do not take by mouth or place in nostrils. Flammable: Keep away from fire or flame. Do not use if epileptic, with high blood pressure. Ask a health care practitioner before use if you have persistent or chronic cough such as occurs with smoking, asthma, or emphysema cough accompanied by excessive phlegm (mucus). When using this product, do not heat, microwave, use near an open flame, add to hot water or any container where heating water. May cause splattering and result in burns. Stop use and ask a health care practitioner if cough persists for more than 1 week, tends to recur, or is accompanied by fever, rash, or persistent headache. A persistent cough may be a sign of a serious condition. If pregnant or breast-feeding, do not use this product. Keep out of reach of children. If product is swallowed, get medical help or contact a Poison Control Center right away. Flammable. Keep away from fire or flame. Do not use on wounds or damaged skin, if epileptic, or with high blood pressure. When using this product avoid contact with the eyes and do not bandage tightly. Stop use and ask a health care practitioner if condition worsens, or if symptoms persist for more than seven days or clear up and occur again within a few days. If pregnant or breast-feeding, do not use this product. Keep out of reach of children. If product is swallowed, get medical help or contact a Poison Control Center right away. Keep out of reach of children. For external use only. If swallowed, seek urgent care/call poison control. If skin sensitization occurs, rinse with vegetable oil. Avoid eyes and mucous membranes; if contact occurs, rinse with vegetable oil. Do not use if pregnant/breastfeeding, with high/low blood pressure or if epileptic. If allergic reaction occurs, stop use and consult a health care practitioner. Keep out of reach of children. For external use only. If accidentally swallowed, seek urgent care/call poison control. Avoid eyes and mucous membranes; if contact occurs, rinse with vegetable oil. Do not use if pregnant/breastfeeding or if epileptic. If allergic reaction occurs, stop use and consult a health care practitioner. Keep out of reach of children. For external use only. If accidentally swallowed, seek urgent care/call poison control. Avoid eyes and mucous membranes; if contact occurs, rinse with vegetable oil. Do not use if pregnant/breastfeeding. If allergic reaction occurs, stop use and consult a health care practitioner. Contains phototoxic orange essential oil; do not sun tan/use tanning beds for 3-4 days after use. Those in need of a fortifying boost to promote their best wellness. A convenient and stylish zip pouch made from RPET recycled fabric. Conveniently sized to take with you wherever you go, carry this with you to feel supported all day long. 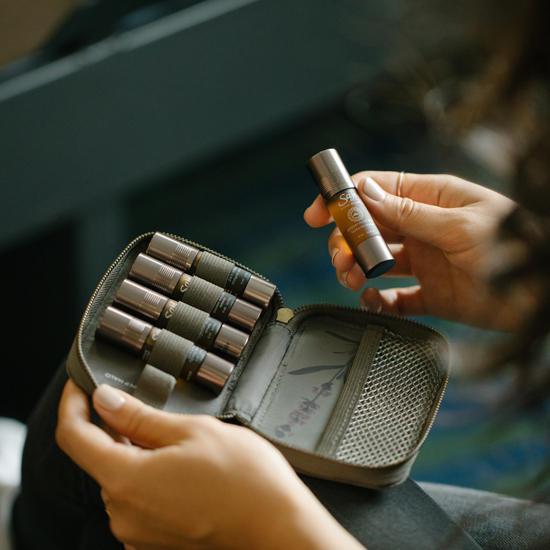 Roll on Peppermint Halo to soothe your head, Stress Release to relax, Pain Release to relieve minor aches and pains, Gutzy to comfort the stomach and Fortify to relieve cough and cold symptoms. 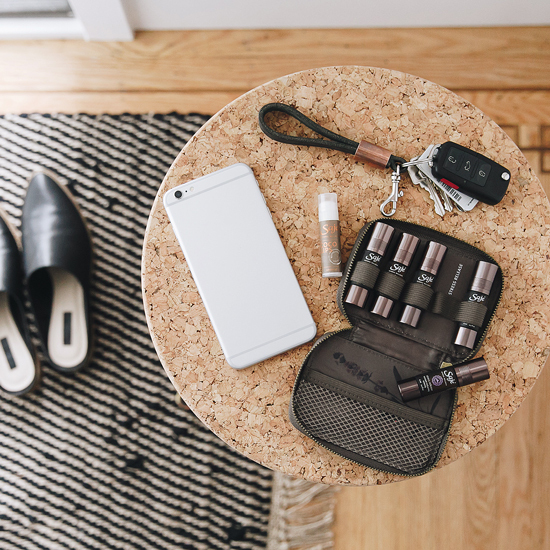 Carry this kit with you to feel supported everywhere you go, all day long. 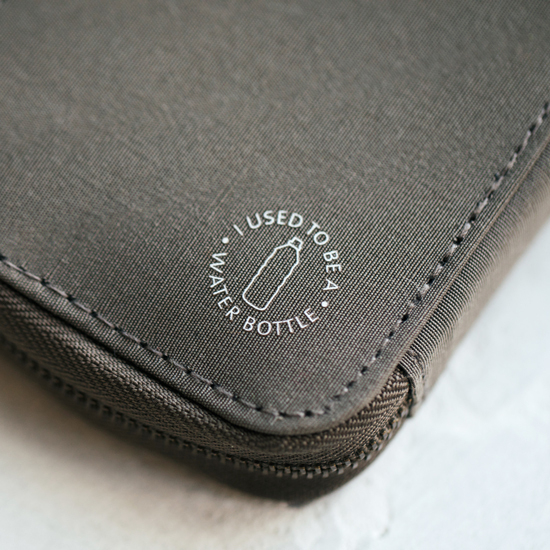 This compact and durable pouch is made from recyclable materials to help reduce the impact of plastic on our planet. This Product is a must Have !!!! Since buying the pocket farmacy I have been nothing but please it's an overall health kits as far as I'm concerned. My favourite out the kits has been Stress Release & Peppermint Halo. I love this! I bought this for a friend to give on her birthday but then I decided to keep it for myself cause it's that good lol. I work in an office so most of the time I get tension headaches and I use the peppermint halo all the time! It works like magic! I also hate taking medication for my pain so I'm glad I use these essential oils instead. I use everything in the pouch so it's definitely worth it. It's so amazing that I've convinced 3 other coworkers to purchase it and they did! Now our office smells like a Saje store lol. 100% recommend it!! I love the portability of this! Such good smells! I want another with different smells too! They're great for everything they represent...hola peppermint my favorite. But I do love every last one. I come across this brand on YouTube watching what's in my purse. Guys every home need one of these I have recommend this to a lot of my friends. This is also a great gift. So convenient to have these remedies in my purse! I was on my feet all day, more than usual this week and my sore foot was really acting up. Pain release to the rescue—it really made a huge difference A few weeks ago I was out of town and experienced some "travellers tummy". I remembered my pocket farmacy and immediately used the eaters digest. Problem solved. When I drive long distances I use peppermint halo to energize myself so I don't get drowsy. I know this may sound contrived, but it isn't. It's really true and these remedies really help alleviate the conditions they were created for. I've given one to each of my children and recommended it to friends. I love this product most of all!